Welcome back to Bobbi Brown week, todays post is the second instalment in my four part series and its all about my favourite bronzing powder. I usually don't do bronzer, along with cream blusher its a product that intimidates the hell out of me! But after having it applied for me in a Bobbi Brown lesson I took the plunge into the world of powder contouring and came out the other side looking sun burnt kissed. I absolutely love Bobbi Brown packaging and this bronzer compact is high on my list of lust worthy packaging. Its sleek, black, glossy and it has a huge mirror included, its perfect for carrying everywhere, I literally have no excuse to not look bronzed now! This is hands down the best bronzer I have ever used! Its the lightest shade in the bronzing powder collection, which warms my complexion perfectly. If your like me and are dubious about applying bronzer then I highly recommend this product, it applies effortlessly and can easily be built upon for a deeper glow. I've only recently got into learning how to contour my face shape and I found that I could start off subtly, and when I eventually gained more confidence I started building it for a more noticeable contour. This bronzer is slightly on the pricey side, at £27 it is definitely a splurge product, however it is sooo worth it. I hope your enjoying this Bobbi Brown series, my next post will be all about my favourite Bobbi lipstick. Let me know which Bobbi Brown products you cant live without. This week Bobbi Brown is taking over my blog! I'll be posting about my favourite Bobbi Brown products over a four part series, the first of which is about my favourite foundation. I've recently become obsessed with Bobbi Brown products and after having several of their make over lesson's, I've accumulated a rather sizeable collection. Crikey Moses look at that packaging how gorgeous is it?! Its a silky foundation stick housed in black and gold packaging, uber sophisticated, much like YSL packaging. I love how simple it is, but how you instantly recognise its high end quality. Argh I just love it! I do believe Bobbi Brown made this foundation shade with me in mind, my shade being...Porcelain. In the past me and foundation sticks have been sworn enemies, they've shrivelled and dried after a few months and broke my skin out terribly, so when I bought this foundation I was slightly nervous about using it. I don't know if it's this particular foundation or if the formula of foundation sticks have dramatically improved in recent years, but my skin really loves this foundation. Although the formula is moisturising and creamy, it really complements my combination skin, I have no oil break through during the day. I apply it in the standard 'cat wearing a crown' fashion, this being, drawing whiskers on my cheeks, and a crown on my forehead, only me that does this? I then buff it into my skin for a flawless complexion. This foundation gives me full coverage without the mask like feeling. The bonus to this style formula is, it makes concealer obsolete, I simply apply more foundation in problem areas, tap in into my skin and it covers perfectly. In the past I've found foundation sticks to be fast drying making it blend out unevenly, but this formula is so creamy that it blends effortless and I don't have to work fast with it. This really is the perfect foundation for days where time is something you don't have, its quick, easy and fuss free to apply and it doubles up as a concealer, bonus! A small amount of this foundation goes along way so it really will last you forever and a day, making the £28 price tag more justifiable. I absolutely love this foundation, it has rapidly made its way the top of my repurchase worthy list. Please let me know which Bobbi Brown products you love! I hope you enjoyed the first instalment of my Bobbi Brown series, my next post will be all about my favourite Bobbi bronzer. Today I'm back with a skin care product that'll be sure to detox your skin after the over indulgent long weekend we've all just experienced. Several weeks ago I was stocking up on cotton wool pads in Boots when I spotted a skin care sale, and I'm a sucker for lotions and potions so I impulse bought a fair few items. I had been researching clay face masks and asking fellow beauty bloggers which clay masks they swore by, but then I saw this product included in the sale and thought ahh why the hell not? The packaging is not the most eye catching, but for 75p I really cannot complain. It holds a modest 50ml of product in a squeeze top bottle. Spoiler alert...I LOVE THIS PRODUCT...That been said let me tell you why I love it so much! The smell is so light and refreshing, I usually don't buy heavily perfumed products as my under eye area is very sensitive, but this product is so lightly scented that it does not irritate my skin one bit. If your like me and think the longer you leave something on the better the results will be, then you'll do exactly what I did...leave it on for 20 minutes, then struggle to wash the damn thing off, I was finding green flakes in my hair for days. The formula is so lightweight that it dries almost instantly, so 3 minutes is more than sufficient. Boots recommend using it twice weekly, but I use mine when my skin needs a detox or when I want a midweek pick-me-up, I use an old foundation brush to paint it on and really get the spa treatment feeling. 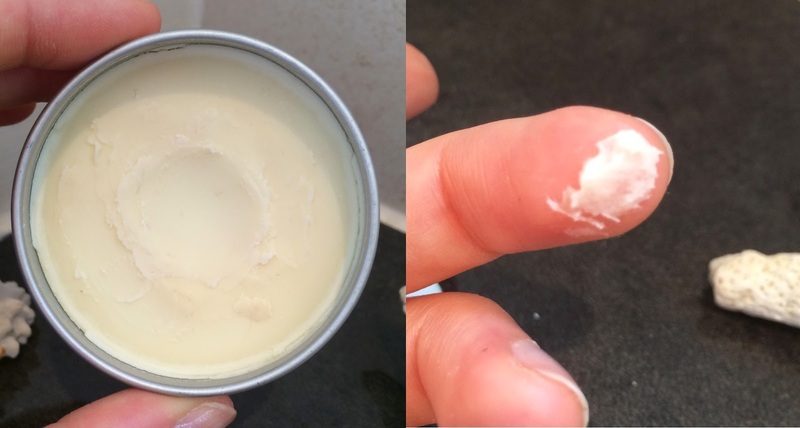 Using the LUSH Ocean Salt Face Scrub (review here) beforehand has really maximised the effects and drawn out some of my most stubborn impurities. Even after the first application my skin felts so soft and moisturised and looked healthy and glowing, which on porcelain skin is hard to achieve. Well I got change from £1 so the price is spot on, it usually retails at £1.50, so full priced it not going to going to make your bank balance cry, like some of the other clay face masks on the market. This is my first time using a clay mask and for once I'm glad I impulse bought, I've saved myself quite a few penny's to put towards other items on my beauty wish list. At the minute Boots have a 3 for £3.00 offer on all there skin care products so you can stock up on some beauty essentials. Let me know if you've discovered any cheap hidden gems that I should check out. 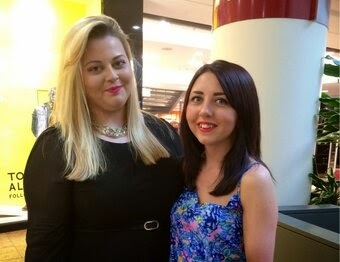 Todays post is a tad different, there will be make up as usual, but also a bit of blogger bonding. I never thought I'd meet so many lovely people through blogging, who have the same interests as me and I never thought I'd meet them! 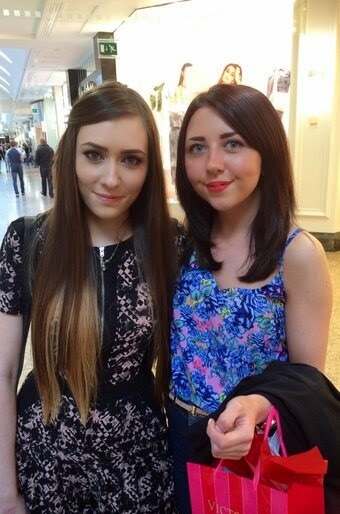 But this Easter weekend I had the pleasure of meeting the gorgeous +Charlotte-Louise Thompson (blog link here) and the beautiful +Marissa Hunt (blog link here) for a beauty shopping spree. From first sitting down to tuck into our burgers, to saying goodbye there wasn't a single second of silence, we really hit it off! I did bring my new shiny camera but I was too busy chatting and shopping that I hardly took any photos. First stop Illamasqua for Charotte's Hydra Veil, which sadly was out of stock, but we got to play with the tester and got invited to the Illamasqua Beauty Bloggers event. I couldn't resist swatching some of the Intense lip glosses, they really are opaque, I love the blue shade. Next stop MAC where Charlotte and I stocked up our palettes and all became obsessed with how wet the MAC face wipes are. 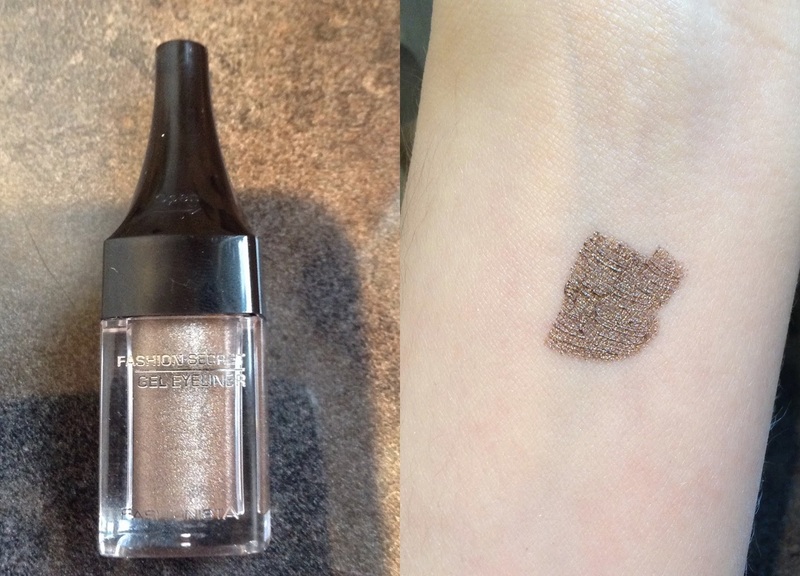 Next we admired all the Bare Minerals loose eye shadow pigments, but sadly they were all too glittery for us. Last stop was Victoria's Secret where we each bought one of their famous body sprays. I also learnt I have no sense of smell as I could only smell two or three of the scents! I hope you enjoyed this mini post, go check out +Charlotte-Louise Thompson and +Marissa Hunt blogs you wont be disappointed! I hope you had a relaxing long weekend, I usually work bank holidays so it was a luxury to have the whole weekend off. Todays post is another review which has been tried, tested and repurchased. I was given a cute Clinique tester all the way back in January and I purchased the larger product in March because I loved it that much! I find with mascaras its all about the wand, that's just my opinion, so I've linked packaging and product together. First of all let me say how boring the packaging is...a plain white tube? If I saw this in a shop my eyes would skim right over it, lucky for me I was given a sample so this wasn't the case. That's all I'm going to say about the packaging because lets be honest it's all about they wand! If your like me, when shopping for a new mascara you'll just open a tube to look at the wand, and on so many occasions I've over looked the 'comb' style wand. I always assumed that a comb would give me the length but not the volume I crave, but I was so very wrong. The thinness of the comb allows me to get right to the base of my lashes without poking myself in the eye, which gives me more volume, I can also twist and turn the wand so any clumping lashes get teased apart. The rubber bristles allow me to easily scrap off excess mascara so I don't apply too much. It dries very quickly, making it very buildable, usually two layers gives me long and full lashes. There's only one issue with this mascara, the length of the wand makes it so awkward to coat my lower lashes, I usually do the inner half perfectly but when I have to coat the outer half I cover half my face with mascara. I paid £16.50 for my product, I think this is a fair price, especially seen as there are high street mascaras close to this price. Have you used this mascara before? What were your thoughts? It seems that every few months there's a product that people go absolutely crazy for and my bloglovin' feed blows up with reviews, swatches, tutorials, you name it its blogged about, and for me this past few months or so that's been the Bourjois Happy Light foundation. Usually I wouldn't opt for a light coverage foundation with a none matte finish, but I've read tons of great reviews so I thought I'd give it a whirl. I bought my product from ASOS, to take advantage of 10% student discount and free delivery, I did have the hard task of colour matching myself, but I got that spot on *victory pat on the back*. The packaging I'm indifferent to, I neither love it or hate it. Its not the most eye catching product but it doesn't reside in my everyday makeup bag, so that isn't a worry for me. I do not own a light coverage foundation or a tinted moisturiser, so on days where I need to be in public for literally 2 seconds, I'm faced with the dilemma of applying full coverage foundation or going without. When I started reading reviews about Happy Light and how oil free and light it was, I thought it would be perfect for the aforementioned dilemma. I find it to be so lightweight that it feels as though I'm wearing nothing at all, I don't even have to powder. It covers only the slightest of imperfections, but I only wear this on days where I'm nipping out and would normally be makeup free, so it doesn't bother me, however if this was my everyday foundation I would have to use half a tube of concealer just to look half descent. My shade is 'Porcelain', I found the colour match to be absolutely spot on, kudos to Bourjois for making perfect pale shades. As I said I saved 10% with my student discount card, so I paid £10.80, but it retails at £11.99. It contains the standard 30ml. I think this foundation is over priced but I wont be using it daily so I wont go through it too quickly. All in all I really like this foundation for what I need it for, however I would never wear this as my daily foundation because the coverage is just too light and sheer. Let me know if you've tried this foundation and what you think of it? 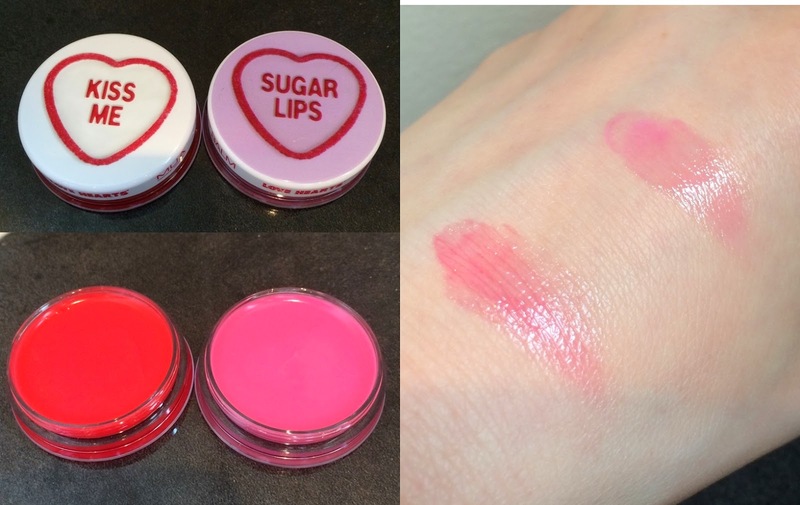 Today’s post is inspired by a post I did a while ago (link here) , where I rummaged through my makeup collection and chose some unloved items to start using every day, one of those products was Benefits Dr. Feelgood. I've used this product religiously since then and thought it deserved its own review. You can still buy this product, so I'm not raving about a discontinued product. I love vintage Benefit packaging, they seemed to put more effort and thought into the designs, newer products that come out seemed to be flawed or rebranded products seem to appear cheap looking. It comes in a hefty sized tin with a picture of a handsome doctor wooing a young maiden on the lid. It did come with a sponge which I threw away because A. it collected dust, B. it looked grubby and C. it served no purpose in picking up the product. Benefit describes it as a balm, although I would say it’s more wax like, it’s quite hard so the warmth from your fingers definitely helps, just make sure there squeaky clean beforehand. I was told by a ‘Benebabe’ that this is the solid version of Porefessional, and gives the same affect and finish. I don’t suffer from enlarged pores or fine lines, but I can notice a difference in that my skin appears airbrushed. I use this mainly on my nose and I’ve found that besides it looking airbrushed it also keeps the shine away and keeps me matter for longer. It has a light lavender scent, which is a nice surprise because it looks as though it should smell like an unscented candle. This retails at £22.50, although mine was originally a gift. I’ve been using mine daily for two months and it has got a visible dint in it, however I don’t think I’ll need to replace it this year. If you were using it all over your face I would say you would definitely need to repurchase more than one a year. I hope your all enjoying my new blogging schedule, I mentioned several posts ago that I was starting a routine, and I'm well and truly sticking to it! 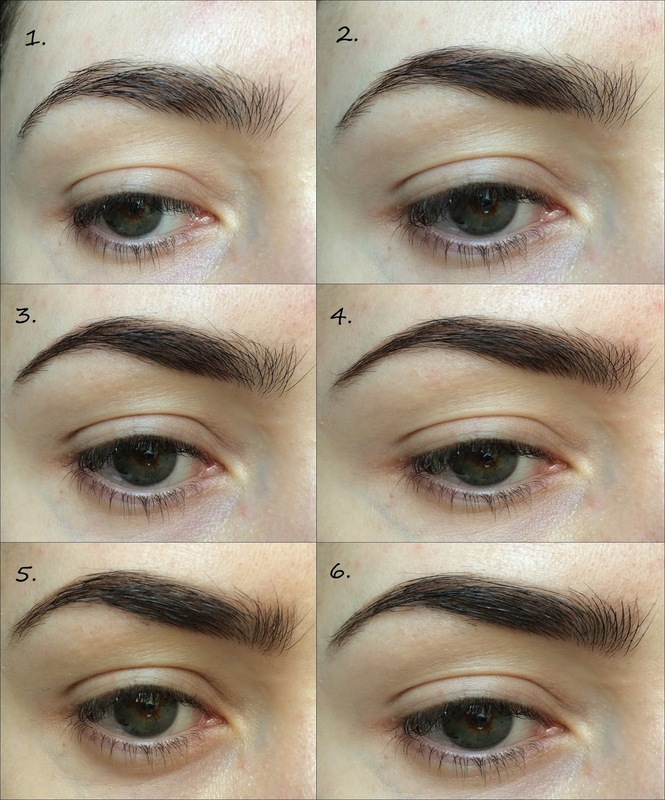 In my last post I promised I would do an eyebrow tutorial for you, so here it is! For those of you that didn't read my last post, it was something different, I shared my experience of HD eyebrows (link here). I normally use clear gel to set my eyebrows, but I recently bought Benefit Gimme Brow, and although I do not particularly like it, it was £17.50 so I'm trying to use it up and get my moneys worth. You don't have to use the same products as me, this is just what I use to fill in my brows. Step One - comb through your eyebrows with your spoolie, making sure the hairs are in a shape you're happy with. If you don't have a spoolie you can use an old mascara wand, just make sure its thoroughly clean, or you could buy the MUA E5 brush for £1. Step Two - Take your powder and brush fill in the middle third of your eyebrow, I like to make this section quite dark so I press the powder into my brow rather then sweeping it through. Step Three - Fill in the outer third using the same method as before, take your time doing this section so you don't over draw your eyebrow - if you do, take a cotton bud and clean around the edges. Step Four - Don't apply any extra powder to your brush, just lightly sweep what's left on the brush through the inner third of you eyebrow. Doing this makes them appear softer and more natural. Step Five - Take your gel and comb it through the outer two thirds of your brows in a horizontal motion, make sure your gentle and don't press on your skin otherwise you'll smear your powder. Step Six - Comb the gel vertically through the inner third, again be gentle. Step Seven - Enjoy gorgeous eyebrows! I hope you found this helpful and maybe gained some tips for when your doing your own eyebrows. Let me know if you'd like to see tutorials as a regular thing. 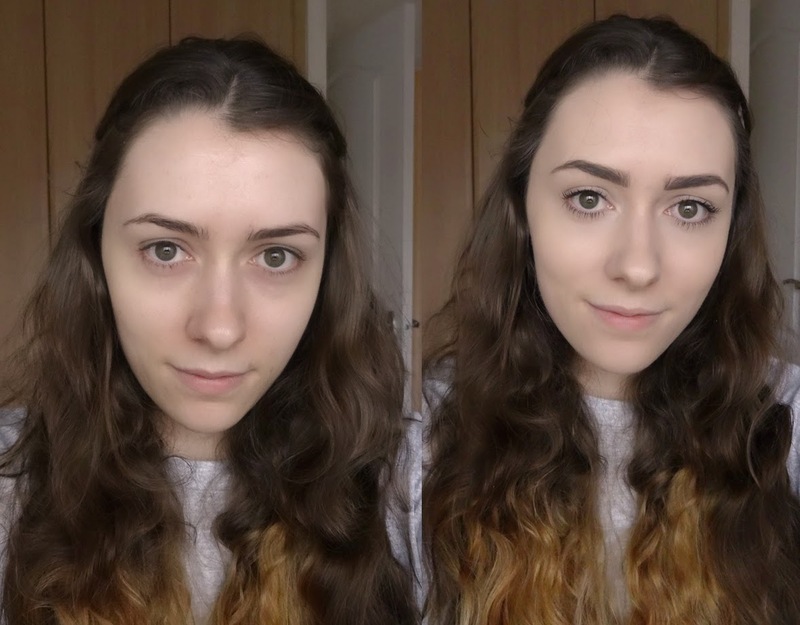 Today’s post is a slightly different one, I’ve been having my eyebrows HD’d for around 3 months now, so I thought it would be nice to explain more about my experience with HD brows and show your some before and after photographs. I started my HD brow journey in January, after finally having enough of plucking my eyebrows into an okayish shape myself. I did a quick internet search to find a salon near me and found a link to the HD brows official website, where you could search your postcode to find a registered HD bow specialist, and luck had it there was one near me. My first visit was just a standard wax and my HD brow technician, Tara questioned me about what shape I eventually wanted, which was bold and dramatic. She measured around my face and informed me my brows were too far apart and too short, basically I was too heavy handed with the tweezers! She waxed the bits I didn’t need and left the areas that needed to grow. It took a lot of getting used to because she’d not touch the middle section, so I thought it looked like I had one eyebrow, but the next day at work I got so many complements on how they looked, and in time I started to get used to them myself. Before my next appointment, I had to apply a patch test in the form of a temporary tattoo - I felt like a kid again! I sat with Tara and flicked through what could only be described as an eyebrow catalogue, and I chose the shape I wanted, they do all have names but sadly I can’t remember what mines called. 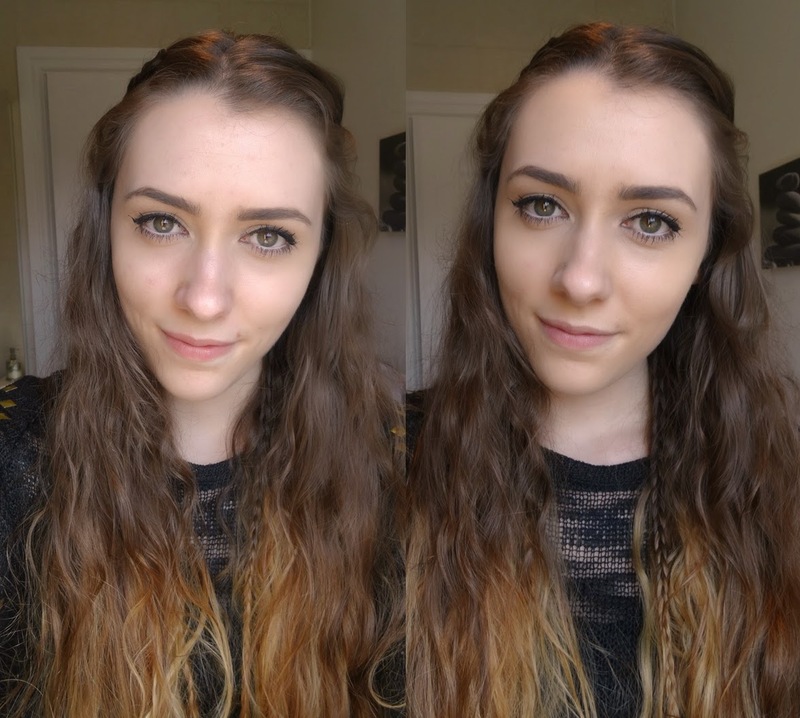 Once I was happy with my choice I chose the colour of my brows, I wanted them to match the colour of my hair so they were tinted slightly darker, this literally takes minutes, and it’s unreal how fast that tint works! The next step was waxing in the shape I had chosen, I was lucky that my brows had grown so quick and I could have the shape I wanted straight away, depending on the shape you want, you could need several visits. She then threaded away any harshly tinted hairs so my new brows blended into my face, then she plucked any stray ones away. Lastly my brows got a haircut, which I thought was weird but they looked amazing for it. She then filled in any sparse areas for me which was hardly any, I’m blessed with thick brows, think Jim’s dad on American Pie. And voilà my eyebrows were HD'd! The whole HD brow experience costs me £25, which I think is very reasonable. I find they look amazing every time I have them done, and it saves me from plucking every week. I also love been pampered! If you’re fed up with your eyebrows or think they can’t do any other shape than the one your currently sporting then book in for HD eyebrows! Watch out for my next post, it'll be an eyebrow pictorial. I hope your enjoying my new blogging schedule, its much more reliable than my previous, which was none existent. Just encase you haven't noticed, I've been blogging on Tuesday's and Thursday's with an additional Sunday thrown in alternative weeks. Todays post is going to be slightly picture heavy so I do apologise in advance, but it gives you something exciting to look at. I did originally attempt to do as my first YouTube video, but when I loaded the video to my computer I found the quality wasn’t great. 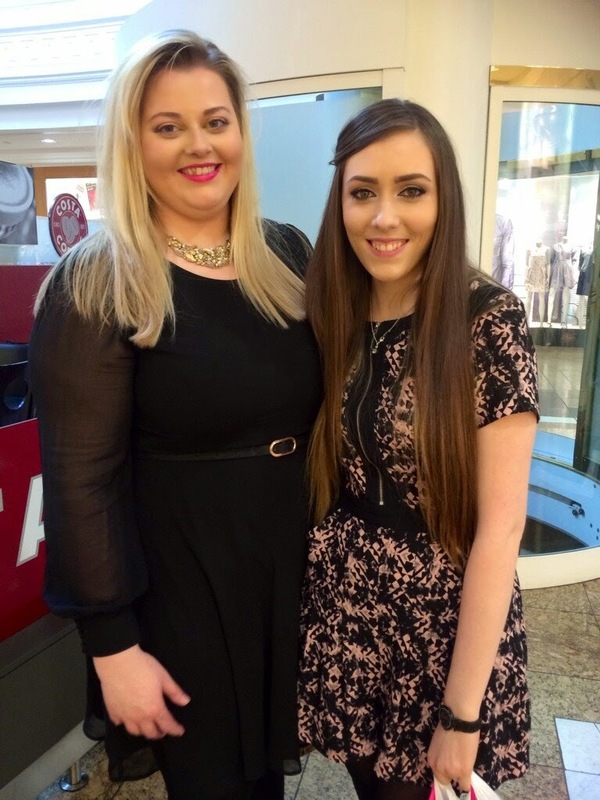 So whilst I save for a bigger and better camera I thought I would do a blog haul for you. I’ve never purchased anything from MUA before and typically I don’t buy high street brands, I think I probably have the odd product, but nothing that’s currently or recently being used, but so, so many people were raving about MUA, and how cheap and good quality it was, so when I saw a recent online offer I took advantage. I picked out these two gorgeous shades, which were only £1. They annoyingly don’t have names, there just numbered, but they're both the ‘pearl’ effect eye shadows. They swatch beautifully, very true to what you see in the pan, unfortunately when It comes to wearing them you have to apply with your finger and press on quite hard otherwise the colour just stays on your finger or on the brush, not the best for delicate eyes. I love a good gel liner and when I saw this shade my heart skipped a beat, it’s a gorgeous dirty bronze colour, not shimmery but not flat, just the perfect shade. Unfortunately that’s where the positives end, the brush you get is terrible, it’s more like a lip brush no way could anyone achieve a decent line with it. The pigmentation is okay, the usual dip of the brush doesn’t suffice, at least three layers would be needed to get a decent colour payoff. The formula is a nightmare, it’s too creamy so it never dries it just smears everywhere. I had to get this product, everyone and there mum has told me how I need this in my life! It looks like a powdered version of my beloved Benefit High Beam, It’s so hard to photograph but its shines the most gorgeous silver/pink. 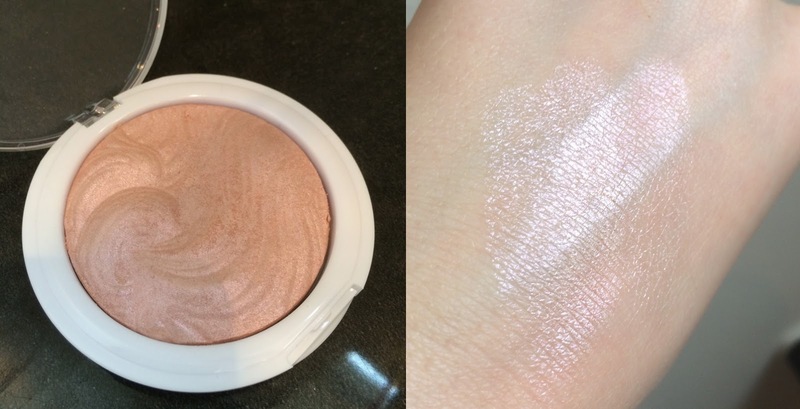 Don't let it fool you, it might not look much in the pan, but applied to your cheek bones and caught in the right light, your face will light up like a disco ball. These have got to be one of my favourite products of the haul, there super moisturising and have a tiny hint of colour. I literally feel my dry patches rehydrate in seconds. They cost a ridiculous £1.00 each. I’ve wanted a white eyeliner for a while, I find it just opens up your eyes, without it looking too dramatic. When I saw this for £1 I added it straight to my virtual basket. 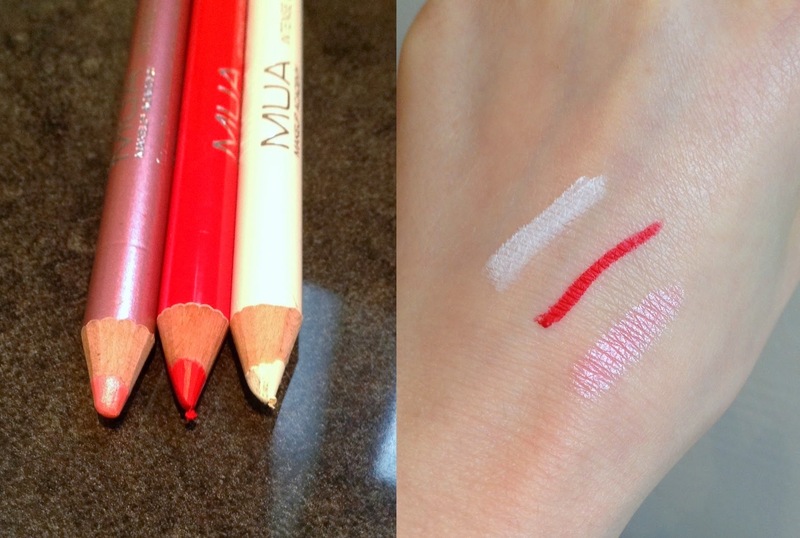 It has great pigmentation, very soft and long lasting, everything you could ever need from an eyeliner. So now onto the lip liners, I honestly don’t own many so I thought it was time that changed, especially when these were a mere £1.00 each. I absolutely love Red Drama it’s a really creamy and soft formula. Softly Lined I do not care for, it’s chalky, pulls at my skin and makes my lips stick together, a terrible product compared to Red Drama. I bought the eyelash brush to use as a spoolie for my brows, for £1 it was a bargain, need I say more? The blush and contouring brush I bought exactly for what it says, it applies my blusher perfectly, it has a thinner end so I can blend seamlessly into my hairline. Fashionista Maxi-Moisture Lipstick – How do I Look? All in all there are some really good products, and for very reasonable prices. I paid in total, £19.50 for everything pictured here, that included delivery, which at the time was £1. All in all I'm quite happy with my purchases, apart from the eyeliner, that was a disaster, but for £3 it hardly broke the bank. My advise for anyone wanting to try MUA, read some reviews and watch some first impressions, you'll find out what the superstar products are and which ones are worth giving a miss.